Asbarez Staff Writer IRWINDALE–Calif.–Two months ago–Armenia ushered in a new era of freedom and economic stability as it elected Robert Kocharian its second president. Monday afternoon at the Irwindale headquarters of the Miller Brewing Company–Armenia took a giant step toward making the dreams of that new era a reality–as it signed an agreement with the Milwaukee-based beer giant to import Miller products for sale in Armenia. The three-year deal signed between Miller and Uniservices–Ltd.–a Yerevan-based company–is the first in what is hoped will be increased foreign investment and export into Armenia. "Miller is proud to be associated with Uniservices–and looks forward to a long relationship with Armenia," said James R. Malcolm–Miller General Manager for Eastern Europe–the Middle East and Africa. "Armenia now joins a network of more than 100 countries where Miller products are sold. We are confident this agreement will further strengthen Armenia’s economic growth." Malcolm would not comment on the specifics of the deal–but did say Armenia would receive a percentage of sale profits. Malcolm also added that there were no plans to open a brewing plant in Armenia at the present time. "I thank the Miller Brewing Company for its trust in our nation–in my people–and in Armenia’s," said Gagik Asatryan–President of Uniservices–Ltd. "Miller is one of the first world-famous companies to enter Armenia–and I am confident our country will grow and prosper because of it." Asatryan presented Malcolm with a commemorative silver coin and a Karabakh Independence medal following the signing of the contract. Armenian Vice-Consul Grigor Avetisyan was also on hand at Monday’s ceremony representing the Armenian Consulate’s Office–and had words of praise for the agreement and its future implications. 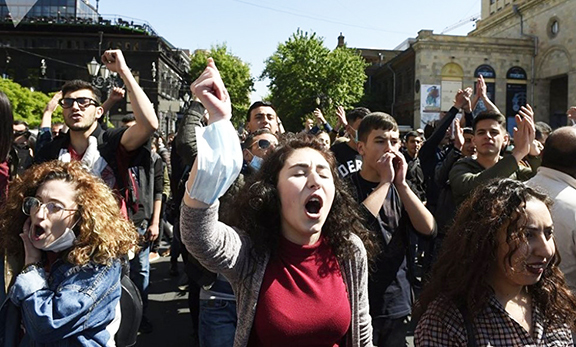 "This day is an important day in Armenia’s economic development," Avetisyan said. "This agreement will improve and strengthen the economy. It will open doors." Avetisyan and Malcolm exchanged pins to close the event. Also at the ceremony were Ara Terminassian and Stella Ter-Minasyan of Uniservices–Ltd.–and Uniservices attorney Vartkes Yeghiayan. "We know that the Miller Brewing Company is a member of the Phillip-Morris family–and so–we are honored to have one of the world’s largest conglomerates investing in Armenia," Yeghiayan said. "This move speaks volumes for what is yet possible." Malcolm led the representatives from Uniservices and members of the media on a guided tour of the Miller plant–including stops inside the packaging and brewing facilities where bottles and cans of Miller beer products are filled and packaged for shipping.